Since the focus of this lesson is rhythmic, the chord progressions themselves are fairly basic and are the same for each rhythm to allow for a quick comparison when practicing them back to back. Because the chords are the same in this lesson, be sure to practice each rhythmic pattern in all 12 keys, as well as apply them to any and all other chord progressions you know, as well as playing them over your favorite jazz guitar standards. Let’s dive in and learn 10 classic and essential jazz guitar rhythm patterns. The first comping rhythm we’ll explore is probably the most popular and well-known jazz guitar rhythm, the Freddie Green four-to-the-bar quarter note pulse. Made famous by Freddie Green when he was a member of the Count Basie Big Band, the quarter-note pulse is a great way to lay down a swinging rhythm and keep things steady at the same time. While playing this rhythm might not work for a whole tune, depending on the context and genre of jazz you’re playing, it can be a great way to set up a more complex rhythm. So, once you have this rhythm down, try mixing it up with other more syncopated rhythms in order to hear how it can highlight those syncopations while swinging hard at the same time. The next rhythm is also a very popular and well-known pattern that is based on the Charleston dance from the 1920s. Though originally based on a dance craze, this rhythm has since crept into the writing, comping, and playing of countless jazz guitarists as they have modernized this fun rhythmic pattern. When playing the Charleston rhythm, make sure to play the first note long and the second note short, in order to get the most swing out of this rhythmic pattern. One of the ways that players have altered the Charleston Rhythm is to push it around the bar, starting and ending it on different beats in the process. Here is an example of the Charleston starting on the & of 1, rather than on the downbeat of each bar. When moving this rhythm around, you are able to create more levels of rhythmic interest without having to learn a new rhythmic pattern. You are simply altering a pattern that you already know. This is an approach that you can take to any rhythm that you learn. To finish up our study of the Charleston Rhythm, let’s combine the first and second rhythms together in order to build a two bar phrase that starts on the beat in bar one and off the beat in bar two. We’ll now move on to a new rhythm, and one that was heard often in the playing of Jazz Guitarist Jim Hall, the dotted quarter note. In this pattern, you are playing three chords in each bar. This next rhythm is a tricky one to nail without rushing or speeding up.. Playing on the & of 2 and the & of 4 in each bar can help a tune swing and give it forward motion when comping, but it can also lead you to “trip forward” since there are no downbeats in the pattern. Because of this, go slow and work with a metronome, a backing track, or Band in a Box. This will help you become comfortable with this syncopated rhythm, and prevent you from rushing. The next rhythm is a bit easier than the & of 2 and 4 that you just worked on, but it is an essential jazz rhythm and one that is often played in combination with the & of 2 and 4 as you’ll see later on in this lesson. When playing on 2 and 4, make sure that you play each chord short, one quarter note exactly. This helps create a bouncy swing feel in your comping with this pattern. You will now combine bars of 2 and 4 with bars of the & of 2 and 4. There are no rules for how you can combine these two rhythms, but I’ve written out a common pattern below which is one bar of 2 and 4 followed by one bar of the & of 2 and 4. From here, try coming up with your own combinations, reverse this pattern, 1 bar of one and 3 of the other etc. There is no limit for how you can combine these two common jazz guitar rhythms. You can also combine half of one rhythm and half of the other, such as the example below. This example uses the first half of the & of 2 and 4 and the second half of the 2 and 4 patterns. The last jazz guitar rhythm that we’ll explore is a syncopated pattern that places the attacks on the 1, & of 2 and 4 of each bar. When doing so, you are grouping the 8, 8th-notes of the bar into 3+3+2 in your comping. This type of odd grouping with your 8th notes is a great way to create interest and add syncopation to your comping ideas. 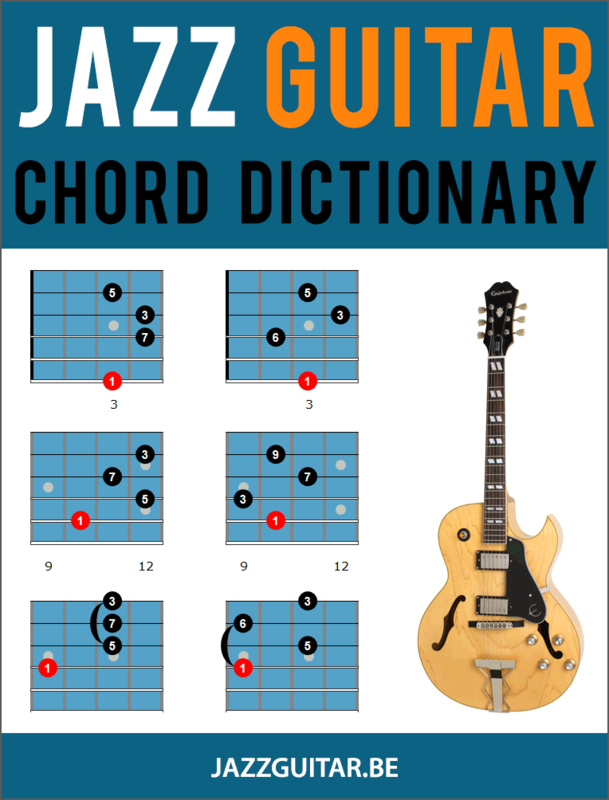 To get these jazz guitar rhythms under your fingers, take an easy jazz standard, such as Summertime or Autumn Leaves, and play through the chord changes using one of the rhythms.